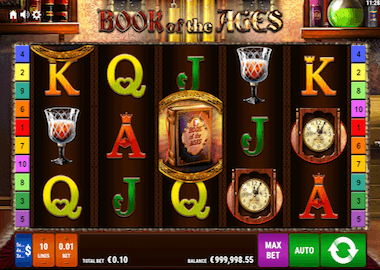 The Book of Ages slot is a five reels slot with three rows and comes from the Berlin software developer Gamomat. The game has five or ten selectable paylines and a minimum bet of 5p. Similar to the famous Book of Ra Slot by Novoline, here too the most important symbol is the book symbol. It is both your wild symbol and your scatter. The Book of Ages slot is also offered by Bally Wulff in real casinos. However, the actual developer is Gamomat and the Book of Ages Slot is in online casinos under the Label Gamomat available. You can play the slot on all popular mobile devices as well as from your desktop. Symbols and Payouts: While the Book of Ra has an ancient Egyptian theme, the Book of Ages slot is about another famous character, Dracula. There are the low paying symbols J, Q, K and A which pay consecutively smaller winnings in the base game. The ace is the most valuable symbol and still pays 100x your bet on an active payline. The theme related symbols are a glass of blood, a candlestick, bats, an old clock and Dracula. Last named symbol is your top symbol with a payout of 5000x your line bet for 5 identical symbols. Double Up and Ladder Gamble: The last symbol, which is also important in the base game, is of course the book symbol. It is your Wild and Scatter symbol at the same time and is also the second most valuable symbol. It pays exactly as the bat symbol up to 2000x your bet. Incidentally, all your winnings can be doubled with the Double Up feature. There is also a risk ladder, which you can climb up with your profits. The advantage here is that you can not lose everything right away, but that you fall down the ladder. Especially with small profits, this feature is recommended. To activate it, just click on the ladder button after making a profit. Free Spins feature: The Free Spins feature is, as is often the case with the Book of Ages Slot, the best bonus feature. Unsurprisingly, you can activate the main feature with 3, 4 or 5 book symbols. You will then get 10 free spins which you can extend with at least three other book symbols. Before you start the free spins, you will randomly get a bonus symbol, which acts as an expanding reel symbol. If you get the bat or Dracula symbols, very big payouts are possible. You keep the bonus symbol for the entire duration of your free spins. Gamomat has been delivering its games to renowned companies such as Bally Wulff or Merkur Gaming for more than 10 years. Many of the slots you also find in real casinos. The most famous parts are Pharaos Riches, Ramses Book or Romeo & Juliet. Gamomat sells its games in its own name, especially for online casinos.You can play the Book of Ages slot here for free (just click on the Book of Ages banner above). Recommended online casinos with Gamomat slots are the Energy Casino, LVbet Casino, 888 Casino or 777 Casino. Check the bonus offers in these casinos in the table below, all of them will give you a free no deposit bonus!